I was a bit skeptical when my friend Rob Lewis suggested we go to Chihuahua. I suppose I had imagined it to be an uninviting desert with few amenities and little culture. But when I began researching it, I became intrigued by the landscape of desert, mountains, and canyons--and by the culture, history, and prehistory of the area. When we finally went on our scouting expedition I was more than pleasantly surprised--we only had six days in country, but I fell in love with Chihuahua. The people of Chihuahua are industrious, prosperous, warm and friendly, and there is a whole lot more than desert in Chihuahua. Look at my photographs, and see what you think. This piece was intended to be a photo essay, but I felt I should offer some words of explanation, however inadequate. Click on any of the small images in this essay to see the entire sequence of photographs. Based on a map of Chihuahua by Tony Burton. Chihuahua is big--not as big as Texas, mind you, but nonetheless the largest state in Mexico--Chihuahua is almost three times the size of Spain. While it is largely desert, quite similar to West Texas, it is less overgrazed, has much more spectacular mountains, canyons to rival Arizona’s Grand Canyon, and a plethora of Native American peoples and archaeological sites. The Chihuahuans have been building a lot of roads--the most recent map we could find didn’t show many of the new roads, and where it showed dirt roads there were often paved ones--a pleasant surprise for us. In all my travels in Mexico, Chihuahua is by far the cleanest state I have been in. Everywhere we went there were signs urging people not to throw trash on the highway and to keep Chihuahua clean. There are three major border crossings from Chihuahua into the U.S. 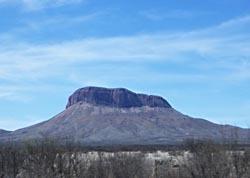 Rob and I used the one at Ojinaga, across the river from Presidio, Texas, primarily because I have a cabin in the Davis Mountains north of Marfa (near Fort Davis). It was an 8 hour drive from Austin to the cabin, where we spent the night, then about an hour and a half from the cabin to Ojinaga the next morning. We might also have used the crossing at Piedras Negras across from Eagle Pass, Texas, if we hadn’t wanted to stay at the cabin. Further West there is a major crossing between Juarez and El Paso, and a much smaller one between Palomas and Columbus, New Mexico. One can also fly into Ciudad Chihuahua from various major airports in the U.S. Rob had already taken care of much of the car paperwork on the web before we left, but we still had to stop at the border and pay the fee for the car permit as well as obtain tourist forms. The forms allow tourists into the country for up to 6 months, and cost 210 pesos. At the time we crossed the peso was trading at about 11.2 to the dollar, so the permits cost less than $20 each. If you plan on returning to Mexico soon, be sure to tell them you plan to stay in country for six months. Sometimes (not always) if you tell them you will only be there for two or three weeks, that is all the time they will enter on the permit, which means if you come again you will have to pay for another permit. In the past, I had to pay my 210 peso entry fee on the spot, but this time I was told I could go to any bank and present my tourist form to pay the fee. This is a lot more trouble than simply paying the fee at the border, since banks in Mexico are always crowded and have limited hours. But I managed. In any case, the crossing formalities took about an hour. No one gets in a hurry in Mexico--we waited patiently while the man behind the counter ate his breakfast. We were on our way soon enough. We drove south through Camargo and Jimenez to Parral. The countryside looks a lot like West Texas--desert with low scrub--but with much nicer mountains. 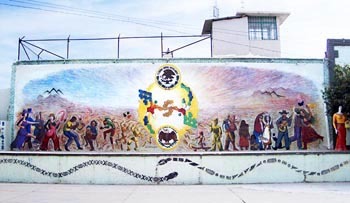 Hidalgo de Parral, founded in 1631, was a mining town up until the 1980’s when the mines played out. Now it is primarily a farming and ranching area where grapes, pecans, and apples are grown. General Motors built a plant there in 1991. 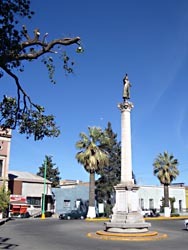 Francisco (Pancho) Villa was murdered in Parral in 1923, and is still accorded great respect, not only by the citizens of Parral, but by much of Mexico. Rob and I appeared to be the only gringos in town. Everywhere we went we were stared at as if we had come from another planet. We were stopped on the street by a fellow who tried very hard to communicate with us, but whom we could barely understand. He was trying to tell us something about Apaches. The Chiricahua Apache lived primarily in the Sierra Madre mountains of North Central Sonora, but often raided as far afield as Arizona, New Mexico and Chihuahua. Later, we speculated that perhaps he was trying to tell us he was a descendant of Apache Indians. I believe he wanted to be our guide and possibly show us Apache artifacts of some sort. Rob tried to explain to him that we were leaving the next morning. He seemed to want us to go with him immediately. We wandered around town a bit and took some photographs. 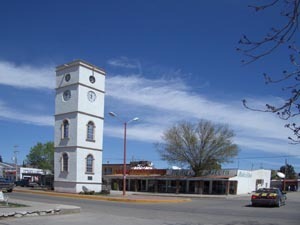 Parral is a nice place, and I would like to go back when I have time to explore it more thoroughly. There is a mine tour that sounded interesting, a Francisco Villa museum, Villa’s grave, an interesting church or two, and I’d really like to follow up on the Apache connection, however tenuous. Parral is a large enough town that we found a 24-hour restaurant where we could have an early breakfast. The next morning we headed West. On this day we passed through some of the most beautiful countryside in Mexico, ranging from high desert to pine forest to canyon country. There is now a paved road all the way from Parral to Creel (pronounced to rhyme with eel). It is a winding mountain road, but in good repair. 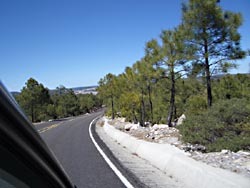 Unfortunately, between Parral and Copper Canyon there are almost no places were one can stop safely, park the car, and admire the scenery. In the few places we found where we could get the car off the road, there wasn’t much of a view. Once inside the canyon, we found a few “miradors” but for the best views I suspect you need to get off the main road. Our car simply wasn’t suitable for rough roads in canyon country, so further exploration will have to wait until we can get back in a sturdier vehicle (or take one of the many tours available locally). Don’t let the map fool you. You might think it is only 80 or 100 miles from Parral to Creel, but the trip takes about six hours. The map gives no indication of the difficulty of the terrain--the mountains, canyons, and winding roads with switchbacks. The only town of any size between Parral and Creel is Guachochi (not shown on my map), and it is actually a few miles off the main road. Much of what I learned about Chihuahua’s canyon area comes from the books mentioned earlier. There are numerous barrancas (canyons) in Chihuahua: Baranca del Cobre, Barranca de Batopilas, Barranca de Urique, Baranca de Chinpas, etc. In our brief journey, we saw maybe 1% or less of what there is to see in this area. To really see it, you need to hike it, and we simply didn’t have the time. Copper Canyon (Barranca del Cobre) is said to be 4 times the size of the Grand Canyon! For those who do not or cannot hike, and even those who can and do, the Copper Canyon train ride is said to be an excellent way to access the most beautiful parts of the canyon. See the Northern Mexico Handbook for details. I really wanted go to the small town of Batopilas, because there is a “lost” cathedral there which I wanted very much to photograph. Unfortunately, the road to Batopilas is unpaved, and we felt Rob’s Toyota Echo might not be able to negotiate it. We did learn, however, that there is bus service from Creel to Batopilas, as well as private tours that will take you there and many other places as well. Creel is about 7,700 feet above sea level. A rail depot and logging town, it has become a major tourist destination by default. By virtue of its location, Creel is the primary staging point for expeditions into the canyon country. We positively hated the town. Our outlook may have been colored somewhat by the fact that the heat in our hotel was turned off at 8 PM, and the temperature fell below freezing that evening. We had tried several higher-end hotels, but they were full up. Lesson: if you plan to stay in Creel, make reservations in advance. Creel was colorful, but too much of a tourist trap for our taste. We got up before dawn and left. There was frost on everything. There is some beautiful country between Creel and Cuauhtémoc--mountains interspersed with high mesas--most of it farm and ranch country with many orchards. We had a late breakfast in Cuauhtémoc. Rob had originally intended to spend some time exploring Ciudad Chihuahua. Perhaps he had imagined it as I did--a quaint, dusty town with adobe buildings where everyone wears sombreros and cowboy boots. What we found was a modern glass and steel metropolis of over a half-million people, seething with traffic and obviously a major commercial center. It wasn’t nearly as appealing as we had imagined, so we drove around on the periferico (peripheral highway). We were again pleasantly surprised when we discovered a cuota (toll road) that took us most of the way to Nuevo Casas Grandes. This reduced our travel time considerably and enabled us to reach our destination by 3 PM. Along the way we stopped briefly in Ricardo Flores Magón, a pretty little town named after the famous revolutionary figure. Nuevo Casas Grandes, the commercial and supply center for the local farming community, is only beginning to realize its potential as a tourist destination. It has a population of about 100,000, and is situated at an altitude of 4845 feet (1463 meters). It is a pleasant town, though not particularly beautiful. Its attraction is that it is large enough to have nice hotels and a few decent restaurants, and it is quite close to Paquimé and other important archaeological sites. We stayed in the Hotel Hacienda, apparently the best place in town. It cost us $70 a night for a room for two. There was a group of retirees from Phoenix on a package tour--obviously a lucrative deal for the hotel. Paquimé was our primary destination. We had both said that if we didn’t get to go anywhere else, we had to see Paquimé. Located in Casas Grandes Viejo, it was about a 15 minute drive from our hotel. We arrived before the museum opened, but we were able to go down and look at the site anyway. Because of the state of the ruins, visitors are not actually allowed inside. 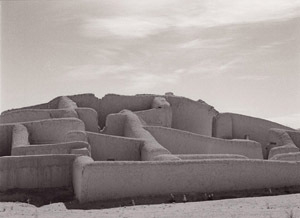 The walls are made of adobe and are much more fragile than those of, say, the Chaco canyon site. I had hoped for some shots looking out through the T-shaped doorways, but had to take what I could get from the periphery. I probably flubbed a chance to get inside the ruins. I was shooting with a Pentax 645, which attracted the notice of a gentleman who asked me if I was a professional photographer. I told him no. He spoke good English and said he worked at the site. I should have jumped at the chance to ask if he could get me a closer look at the ruins, but it simply did not occur to me at the time. Rob suggested later that I might have been a bit more aggressive. After taking photographs, Rob and I toured the museum, which featured not only information about Paquimé but a travelling exhibit about China as well. 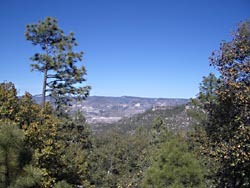 A display in the museum stated that the Paquimé culture was most closely related to the Mogollon culture, exemplified by the site at Gila National Monument in Western New Mexico. I had thought it was more closely tied to the culture at Chaco Canyon, but apparently they are all related. In any case, the folks at Paquimé seem to have had a very advanced culture, which included a complex water storage and distribution system that provided running water in most residences. Almost everyone had a raised cooking hearth and many had heated sleeping platforms. 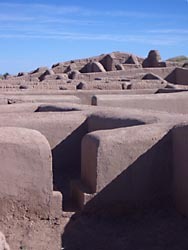 They made fine pottery, raised birds for their feathers as well as for food, and had drainage systems for their plazas. The city shows evidence of careful planning in its design. After leaving Paquimé we realized we still had time to go to Mata Ortíz, the local pottery center. 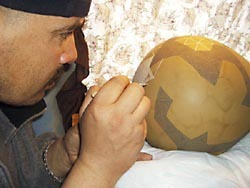 According to Joe Cummings in The Northern Mexico Handbook, one Juan Quezada single-handedly revived the traditional Paquimé style pottery some 600 years after the decline of the Paquimé civilization. Now the entire town of Mata Ortíz is devoted to making pottery. Our map showed a dirt road from Casas Grandes Viejo to Mata Ortíz, but we found a relatively new paved two-lane highway. However, the streets of Mata Ortíz are dirt, and we arrived in the middle of a sandstorm which made it difficult to open the doors of our vehicle, let alone stroll around town in comfort. The lens I had on my camera got grit in it immediately and ceased to focus properly. I’ll be the first to tell you that I don’t know much about pottery. However, I’ve spent a lot of time in New Mexico and seen the fine Navajo and Hopi pottery made there. I’ve also seen the prices fetched by the work of certain well-known potters. I believe if you bought pottery made in Mata Ortíz and took it to Santa Fe you could simply add a zero to the end of the price and sell it readily. We went directly to the Juan Quezada residence, where we found work by as many as 20 different potters on display in his showroom. Señor Quezada’s work was the most expensive, but quite reasonable considering his world-wide fame. Señor Quezada was there, but was occupied in speaking with some other gringos, so Rob struck up a conversation with his son, Arturo, who is also a talented potter. Rob and I both bought some pots, then we asked Arturo if we could see his workshop. He was very happy to show us his modest workshop in a small building behind his home. Arturo also demonstrated for us how he decorates his pots. I recognized the brush as very similar to ones used by Native Americans in New Mexico (made from human hair). I would have walked through Mata Ortíz and taken photographs had it not been for the sandstorm that was raging. But Rob and I were satisfied with our little expedition and decided not to tarry. On the way in I had seen a sign pointing off into the mountains that said “La Cueva de Ollas,” and at Señor Quezada’s place I had seen a photograph of the interior of the cave and decided I wanted to go there. In the event, after driving for 11 miles, we found the dirt road too difficult for Rob’s small vehicle, but I determined to return as soon as possible. The map shows a string of Native American sites stretching for more than a hundred kilometers from Casas Grandes south to Madera. I have no doubt I will return many times to Chihuahua. I want to spend days and weeks in some of the places we simply passed through on this trip. Copper Canyon is near the top of my list, as is the entire area south of Casas Grandes.